Set up the nursery as soon as possible. Let Kitty explore the room during this process. Consider placing a small battery-operated motion detector (sold at Radio Shack) in the crib to discourage him from claiming this cozy bed for his special napping spot. Introduce Kitty to the new scents that he will be living with once the baby comes home by using some of the powders, soaps, and lotions you will be using on the baby. At least one month before the baby’s arrival, establish any necessary changes in the cat’s routine. For example, since cats like to cuddle, it is not advisable to allow the cat in the newborn’s room when the baby is sleeping, so now is the time to close the door and to teach Kitty that it is off-limits sometimes and thats ok! To get your cat used to the sights and sounds of babies, invite friends with babies to visit. If that isn’t possible, try to obtain an audio tape of a baby crying. 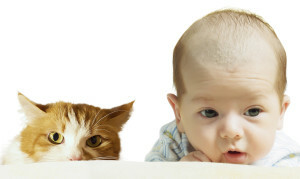 Baby sounds may be the most frightening aspect of having a baby around from the cat’s point of view. Try to desensitize him gradually to this aspect of baby’s presence in the home. Before bringing the newborn home, bring home an unwashed piece of his or her clothing for your cat to smell. Our feline companions identify us primarily through the sense of smell, not sight. Once the baby is home, try to keep your pet’s routine as close to normal as possible. This means regular meal times and play sessions. Don’t wait until baby is asleep to play with Kitty. If he gets praise and attention when baby is in the room, he will associate the new member of the family with good times, not competition for attention. Be patient. Pets need time to adapt. If your cat’s behavior is a little erratic at first, remember that in spite of all your careful preparations, this still a big change for all members of the family. Eventually everyone will settle in and your baby will grow up with the advantage of having the unconditional love and devotion of a feline friend, confidant, protector, and playmate.